Blanch spinach,drain and chop coarsely. Heat oil in a kadhai.Add cumin and garlic and saute until garlic changes colour. Add Whole red chillies,stir for half a minute.Add spinach,stir fry adding coriander powder,cumin powder and red chilli powder. wow Sarithapalak paneer in a new way looks great. I am a big fan of paneer but my hubby don't like.will try your version next time yum yum. Palak paneer is my kids' favourite! Looks awesome and perfect! Send me a bowl! 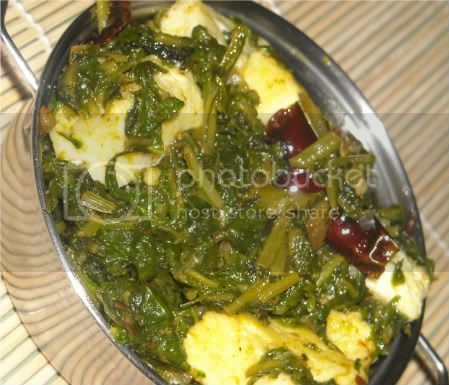 wow.. this method is new to me.. looks yummy..
Great twist to the traditional Palak Paneer recipe! This stir fried spinach dish looks tempting and very new too..
Looks gud ...and sure a must try I say..
Looks good, simple and delicious. You've done this very differently from the usual palak paneer. It is very colourful and must be yummy. Almost like palak paneer but easier.Looks nice. This is such an easier and healthier version. Looks yumm! easy recipe..Can be prepared in a jiff!! Wow simple and healthy dish Varunavi.U told tht u too painted the glass paint.If u dont mine will u post ur paintings in the blog. First time here...nice space...would love to follow u.